Guns, Germs, and Indiana Athletics, 1917-1920: How Did the Great War and the Great Pandemic Affect Indiana Sports? In September 1918, the sports reporter for the Bloomington Evening World wondered how the expanded Selective Service age range (revised to include 18-21 year olds) would affect the local high school basketball team’s prospects. Only two of Bloomington high’s players were young enough to be exempt from draft registration. A month later, the World reported that the influenza epidemic had incapacitated six of the squad’s fourteen players. The intrusion of World War I and a worldwide influenza pandemic disrupted the lives of many Hoosiers. In particular, this article explores how war and the Spanish flu affected Indiana athletes and sports. The Great War and the Great Pandemic had calamitous short-term effects on Indiana athletics, but long-term benefits in developing athletes and sporting culture in Indiana. In September 1917, these thirty-nine civilians from Blackford County were drafted into military service for WWI. They are posed on the courthouse grounds in Hartford City. Source: Indiana Historical Society. A month after Congress declared war in April 1917, the legislature passed the Selective Service Act re-instituting the military draft. The first draft registration began in June 1917 for men ages 21-31. A second draft registration occurred a year later in June 1918 for those who had turned 21 since the last draft, and by September 1918 Congress expanded the conscription ages from 18-45. Indiana as a state contributed 130,670 soldiers to the conflict, over 39,000 of them volunteers. Indiana University claimed that 35% of their alumni and current undergrads had enlisted. Purdue University and Rose Polytechnic in Terre Haute stated that over 12% of their alumni were in the service, whereas Butler College [changed to university in 1925] and Quaker affiliated Earlham College counted around 2% of their graduates at war. Enlistments of college men would ultimately erode the short-term quality of college athletics. A March 1918 article in Indiana University’s Indiana Daily Student reckoned that enlistments and the draft would reduce the number of quality players for the upcoming football season. At Wabash College, several athletes left school at the close of the 1917 football season and enlisted, including multi-sport star Francis Bacon. A Crawfordsville Journal reporter assessed that these athletes had attributes that would make them excellent soldiers. The reporter wrote, “Training, alertness, physical fitness and courage to tackle a hard task and stick to it along with the habit of “team work” have all contributed to their advancement [in the military].” Meanwhile in Lafayette, a Purdue sports reporter held out hope that Purdue’s athletes could avoid military service. He wrote, “If Uncle Sam can do without several of Purdue’s basketball stars until the present season is over, Purdue should be able to look forward to a very successful season.” Uncle Sam could not do without, and Purdue lost the athletic services of several basketball players as well as basketball Coach Ward Lambert, a future Naismith hall-of-famer, to the military. 1917-18 Purdue basketball team. After being conference runner-up in ’17, Purdue fell to .500 in Big Ten play in ’18 without Coach Ward Lambert to guide them. Source: Purdue University Debris yearbook, 1918. College athletics experienced great uncertainty during the war, especially regarding the loss of student athletes to the military. South Bend News-Times reporter Charles W. Call calculated that 13 of the 15 Notre Dame basketball players from recent years were in the armed forces, which was a higher service percentage than any of Notre Dame’s four major sports. Among Call’s statistics was multi-sport athlete, and basketball captain-elect Thomas King, who, in October 1917, awaited a summons to Camp Zachary Taylor, the mobilizing center for Indiana recruits near Louisville. Similar to Notre Dame, IU lost three-sport letterman, and 1917 team basketball captain, Charles Severin Buschman, to the Army when he graduated at the end of the spring semester, enlisted, and received a captain’s commission in September 1918. 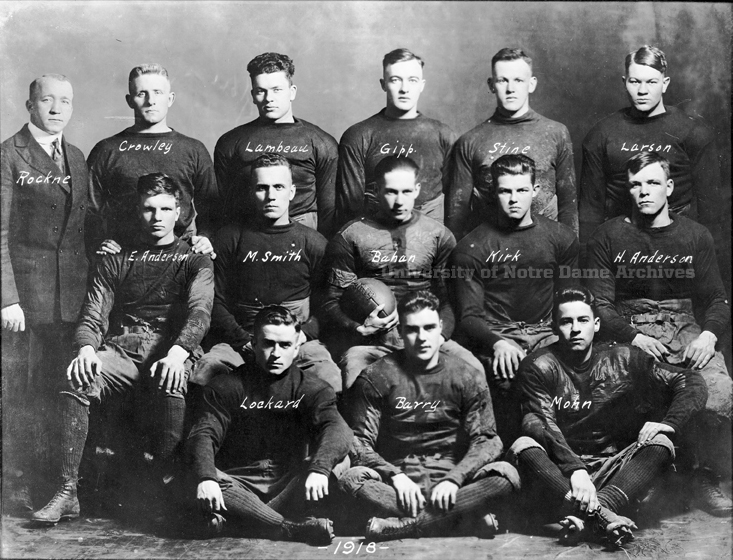 College athletes who became officers in the armed forces came as no surprise to DePauw University coach Edbert C. Buss, who had seen seven of his football eleven* enlist. He assessed the military value of athletics and said, “We feel that college athletics is as big a factor in developing our men as any other department in the university, and it is a well known fact that army officers are picking football and basketball men for some of the most important branches of service.”Arguably the most-famous Indiana college (or ex-college) athlete to be drafted into the Army was 6’4” basketball sensation Homer Stonebraker of Wabash College. College authorities stripped Stonebraker of his collegiate athletic eligibility his senior season in 1917 because he violated his amateur status. Although not an active college athlete, the Army’s drafting of Stonebraker carried such importance that the New York Tribune and the Boston Herald both carried news items on the matter. Indiana University’s 1916-17 basketball team. Three-sport athlete and basketball captain, Charles Severin Buschmann (seated front row with the ball), graduated and immediately enlisted in the Army. Source: Indiana University Archives Photograph Collection. Athletics at Indiana, like all other activities, have been materially affected this year by the war. Not only has the status of the primary sports been changed but nearly every one of last year’s stars who were eligible to play this year are in the service, and the participants for this season must be culled largely from the ranks of the inexperienced. Curiously, even while experienced college-age men were leaving academia for the military, college enrollment grew. At IU, student enrollment increased, even though the quality of their athletics decreased. The Daily Student in October 1918 reported the largest enrollment in the history of the school with 1,953 students; 1,100 of that number were freshmen, and 875 of the freshmen were men, or 600 more males than the first year class enrolling in 1917. More males enrolled to take advantage of the Student Army Training Corps (SATC) classes that were also available at Purdue, Notre Dame and other college campuses around the state. The 1918 freshman class at IU also saw a decrease in female enrollment: 695 down from 780 in 1917. The university authorities speculated that the decreased number of female enrollees was due to young women entering the workforce to take the place of men going to war. Student Army Training Corps, DePauw University, Greencastle, Ind., 1918. Source: Indiana Historical Society. The SATC proved a mixed blessing for the campuses that housed the corps. The War Department initially advised that intercollegiate football in institutions with SATCs be discontinued as a war measure. This policy would allow students to devote 14 hours a week to military drill and 42 hours a week to studying military tactics. Wabash College was without a SATC, and had no such time demands. The Crawfordsville college planned to proceed uninterrupted with their football schedule. The proposed change did not go over so well in football-crazed South Bend with first year coach Knute Rockne. The War Department ultimately backed off their initial proposal and instead set limits on travel, mandating that only two away games could be played during the season that would require the team to be absent from campus for more than 48 hours. Sports on a war basis will probably lose some of the excitement and glamour, but the benefits derived from them will be much greater than it has been in the past. Not a favored few, but the mass of the student body will profit by the advantages thus afforded. Notre Dame Coach Rockne opposed freshman eligibility. The South Bend News-Times explained Rockne’s position: “men . . . might be strong football players but not genuine college students.” Representatives of the Big Ten and other Midwestern college athletic associations met in Chicago and voted to allow freshmen to play in 1918. While Rockne may have opposed the measure in principal, in practice it was a good decision since he had only two returning lettermen including the famous George Gipp. Among the freshmen Rockne coached in 1918 was Earl “Curly” Lambeau from Green Bay, Wisconsin. Already staggering under the new military regulations, middle western football was dealt another blow tonight when a score of colleges and universities cancelled gridiron games scheduled for tomorrow because of the epidemic of Spanish influenza. Nearly 20 of the 30 odd games scheduled were called off. Reports received at Chicago indicated that some of the games had been called off because members of the teams were slightly indisposed, others because of probable attendance due to the influenza epidemic, and still others for the reason that it is feared crowds cause a spread of the disease. Authorities cancelled the first three games on Notre Dame’s 1918 schedule on account of flu quarantines. Health officials even forced Rockne to cancel a practice. IU football coaches cancelled the team’s season finale, scheduled for Thanksgiving Day in Indianapolis, on account of the influenza situation in the capitol city. The flu also affected high school sports. Bloomington High School expected to play their first basketball game of the season on October 18, but the city’s influenza quarantine forced the team to cancel games against Waldron, Orleans, Mitchell, Sullivan, Greencastle, and Indianapolis Technical. Coach Clifford Wells hoped that they could open their season on December 6 against 1918 runner-up Anderson. Hoping to stay sharp, the team played an exhibition game against an alumni team on November 17, but it was not much of an exhibition since health officials mandated the gym doors be closed to the public. The team succeeded in playing their first inter-scholastic game 43 days after their season was set to begin when they defeated Greencastle in Greencastle on November 29. The Bloomington team did not expect to play a home game until after the New Year on account of the flu. Bloomington High School’s basketball team would win the 1919 state tournament despite a rocky season interrupted by flu and war. Their coach, Clifford Wells, was serving in the Navy reserves at the time. Source: Indiana High School Athletic Association Handbook for 1919. At South Bend, the high school cancelled the first game of the season against Elkhart on account of the flu. They scheduled a replacement game against Michigan City, who had not practiced much indoors on account of the flu. The next game on the schedule against LaPorte was cancelled for the same reason. A replacement game against Valparaiso saw South Bend at half strength as one player was recovering from the flu, and two others had fallen ill. While the Great Pandemic in Indiana officially lasted from September 1918 to February 1919, another wave of severe respiratory problems afflicted Indiana the following winter as well. In South Bend, there were 1,800 reported cases of the flu in January 1920. Notre Dame basketball coach Gus Dorais was among the afflicted and lay in the hospital for weeks. In his absence, Knute Rockne took over coaching the basketball team. Mishawaka High School lost a star player for the season on account of an attack of pneumonia that nearly cost him his life. At Goshen High School, basketball captain Clement McMahon recovered from scarlet fever, only to die a short time later from double pneumonia. The playing experience first-year college athletes gained while upperclassmen were away became a competitive advantage to teams in the war’s immediate aftermath. As a Notre Dame sports reporter observed, Rockne made “a team out of a lot of fatheads” whose year of seasoning “will bring back the [glory] days [of Notre Dame].” Major college athletic associations rescinded freshmen eligibility after the war, but they allowed the athletes who had competed as freshmen to have a total of four years of athletic eligibility. The combination of game-tested underclassmen, returning war-tested veterans, and an infusion of good athletes from the SATC who remained in college after demobilization produced extremely strong post-war teams. The best example of this was at Purdue for the 1919-20 season. Coach Lambert returned from his military service, which was enough of a boost in and of itself for the Boilermakers’ prospects. Several pre-war veterans returned to the court and joined four returning lettermen from the previous season. United Press reporter Heze Clark, who had followed college basketball for 25 years, forecasted a strong season for Purdue that should “net them not only the Big Ten Championship, but also western collegiate high honors.” Purdue ended the season as runner-up in the Big Ten, but they tied for the lead the following season, won the Big Ten outright in 1922, and continued to have strong teams throughout the 1920s and 30s. 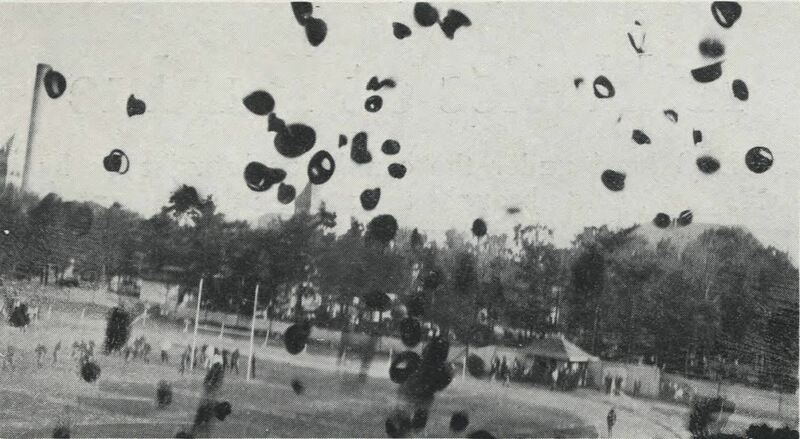 Purdue football fans celebrate a touchdown in 1918 by tossing their hats in the air. Source: Purdue University Debris (yearbook), 1919. This world conflict has proved a number of things but none more emphatically than that intercollegiate athletics, often as they have been questioned in time of peace, have made sinewy and adroit the army of a nation hastening to the ordeal of battle. Another positive effect of World War I on sports was the growth and emergence of professional athletics in Indiana, including football, but specifically basketball. Professional football had a weak hold in Indiana in the early-twentieth century. Pine Village was a notable professional team before the war. After the war, Hammond was an inaugural member of the American Professional Football Association/National Football League from 1920-26. Historical marker, Indiana Historical Bureau. On the other hand, professional basketball in Indiana boomed in the 1920s. Todd Gould in his book Pioneers of the Hardwood: Indiana and the Birth of Professional Basketball just gives passing reference to the war and does not examine the impact war mobilization, male social fraternization, athletic competition in military camps, and demobilization had in the birth of professional basketball. During the war, an all-star amateur squad of members of the 137th Field Artillery, which was constituted of men from northern Indiana, fielded a basketball team in France to compete against other military units. 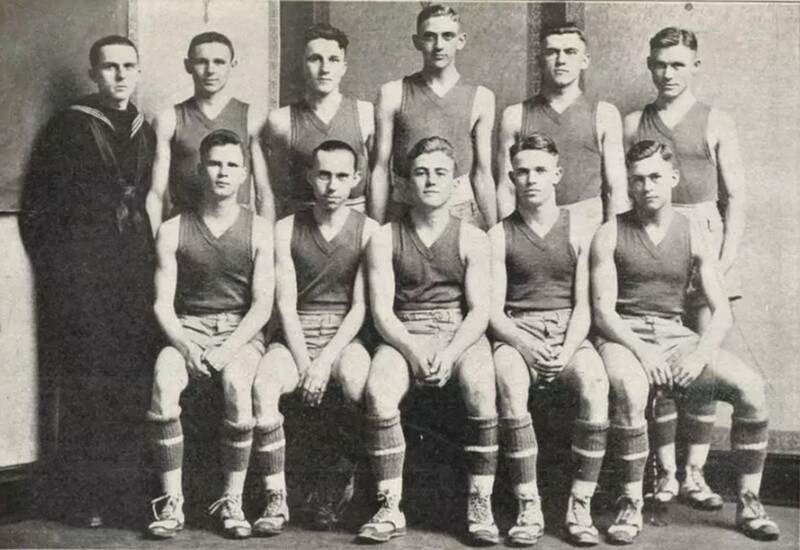 Many such groups of athletic veterans would continue to play as league-independent teams, often with local business sponsorship after the war. Indiana’s basketball star, Homer Stonebraker, made the acquaintance of Clarence Alter while serving in France. 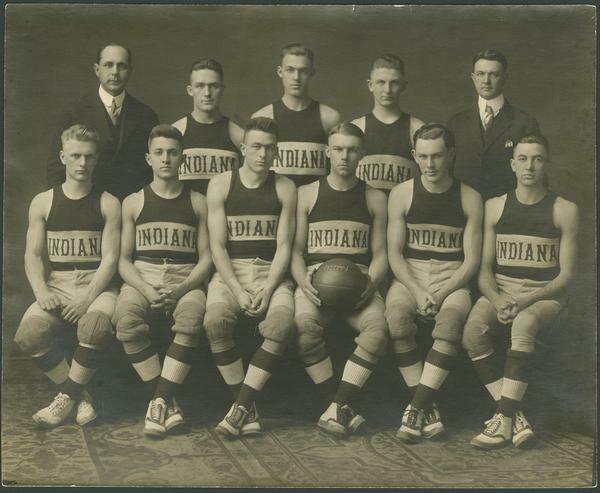 In pre-war civilian life, Alter managed an independent basketball team in Fort Wayne that competed against other independent clubs in the state. Alter and Stonebraker discussed joining forces after they were discharged. Their relationship became the basis of the Fort Wayne Caseys, one of Indiana’s most successful, early professional basketball teams. Alter recruited other veterans for the team, including Stonebraker’s old Wabash teammate Francis Bacon. 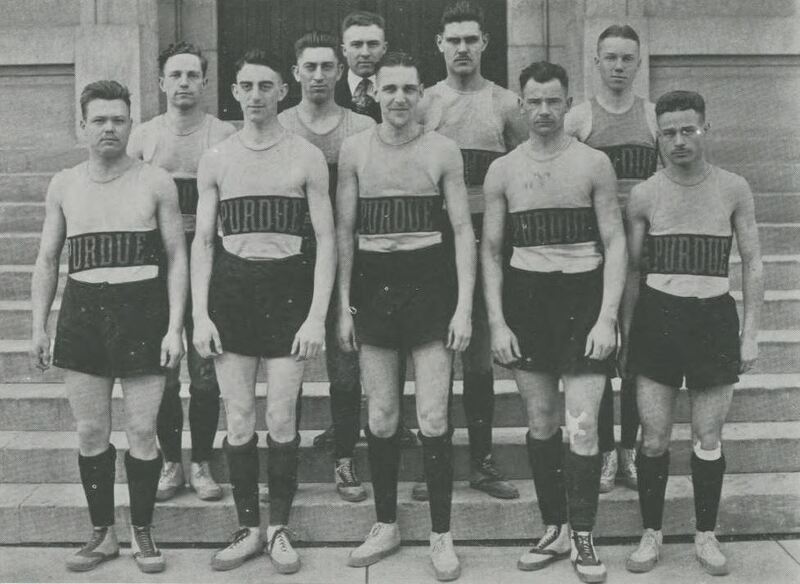 Semi-professional teams cropped up all around the state in the 1920s in cities such as Bluffton, Hartford City, Huntington, Indianapolis, and Richmond. The athletes on these teams were often former local high school stars, but more often than not they were also veterans. The Great War and the Great Pandemic changed sports in Indiana. In the face of severe, outside adversity, sports emerged from the war with greater popularity. In high school basketball, attendance at the state basketball tournament went from 2,500 before and during the war to 15,000 several years later. More racial diversity slowly appeared on high school teams because of the influx of African-American emigrants from the South during the war (although segregated black high schools were barred from IHSAA competition until 1942, individual black athletes could be on teams at non-segregated schools). Some military veterans returned to college and gave a boost to college sports fandom, if not actually contributing on the field of play. The veterans who returned home probably had a greater appreciation if not love of sports from being exposed to them in camp life. This rise in post-war interest in sports strongly contributed to the “Golden Age of Sports” in the 1920s, and the adulation of sports heroes like Babe Ruth, Jack Dempsey, Red Grange, and Rockne. Previous Previous post: The Bee Line and Midwest Railroads reset their goals – to St. Louis: Gateway to the West!